Timing diagram for the I2S lines, from the Philips specification document. A digital audio source will usually create two words of data, one for the left channel and one for the right, once for every sample interval. For example, a CD audio source with a 44.1 kHz sample rate that will deliver two 16-bit words 44,100 times every second. On a single serial line this is a whopping 1,411,200 bits per second (44100 x 16 x 2). How does that poor serial data line keep up? Well, a single serial data line cannot easily convey the word boundaries for left and right samples. It is also difficult (or impossible) to reliable retrieve a clock from it without jitter. So for transmitting audio we really need some other means of delivering those pieces of information. I2S solves both of these problems with extra lines, providing a word select line (also sometimes called L/R clock) to select left or right samples, and a bit clock line to keep everything in sync. That’s all there is to I2S: a data line, a word clock line, and a bit clock line. The specification was formalised by Philips in a 1986 document that made it through the company’s semiconductor division becoming NXP, but sadly has disappeared from the NXP website. Happily the Wayback Machine has it though, so it is still available. Reading the document it becomes apparent that even in the 1980s this was not a difficult interface to work with, and it even gives basic diagrams for a transmitter and receiver. It’s not impossible to imagine that given some TTL chips and a resistor ladder it should be possible to build an I2S DAC from first principles on your bench, albeit not a very high-performance example. 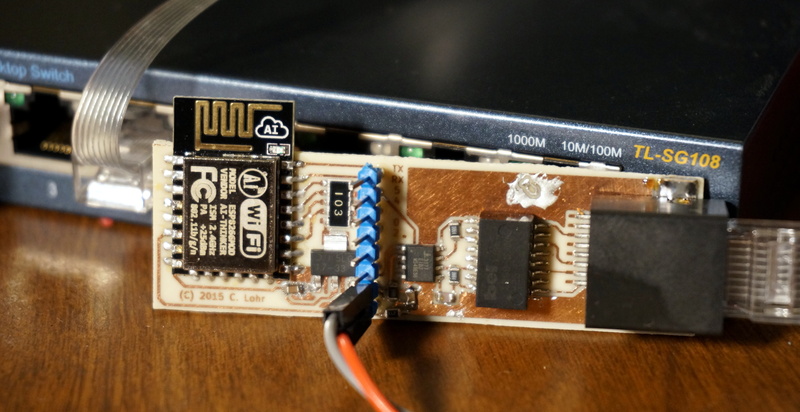 The seemingly impossible: [cnlohr]’s feat of making an ESP8266 do wired Ethernet.So there you have it: I2S. All you need to know about inter-chip audio interconnects, in four handy paragraphs. What more is there to understand? As it happens from the point of view of the work we cover at Hackaday the digital audio origins of I2S are only the start. It is both a loose and a simple specification that is easy to implement, and equally easy to abuse. For example, it does not specify an upper limit for the clock rate. Naturally, its potential as a very fast serial output has led hardware hackers to use it for other purposes. We’ve seen it pressed into service as an AM radio transmitter, an NTSC video output, a VGA output, and even an Ethernet card. How on earth are they doing that! The answer lies in pulse density modulation, a form of analogue to digital conversion in which the number of logic 1 bits in a given time period depends on the level of the analogue signal. This is the raw output of a delta-sigma ADC, and it has the handy property that given only a PDM data stream the digital to analogue conversion step can be performed with only a simple low-pass filter. If you crank up the bitrate on an I2S interface as far as it will go and then feed it words that form a PDM data stream, you can add a low-pass filter to create an ADC with a maximum bandwidth of half its bit rate. The ESP32 I2S table is a lot more complex than the basic standard. There’s an addendum to the list of example projects above using I2S, and it concerns some of those we haven’t featured. The ESP32 has an I2S module, and through it have come some impressive projects such as this full-colour VGA generator. At risk of skirting controversy though, these projects are not using I2S in the strictest sense. The ESP32 technical reference manual page 303 sheds some light on this, revealing that the I2S peripheral in the Espressif part is multifunctional. As well as handling audio I2S as described above, it also handles interfaces for cameras and LCD displays, it’s as though you were to imagine the camera and LCD connectors on a Raspberry Pi routed to the same piece of silicon. Perhaps this nomenclature has its roots in the ESP8266 having an I2S peripheral on chip (page 71), and the shared peripheral in the later device inheriting the moniker. 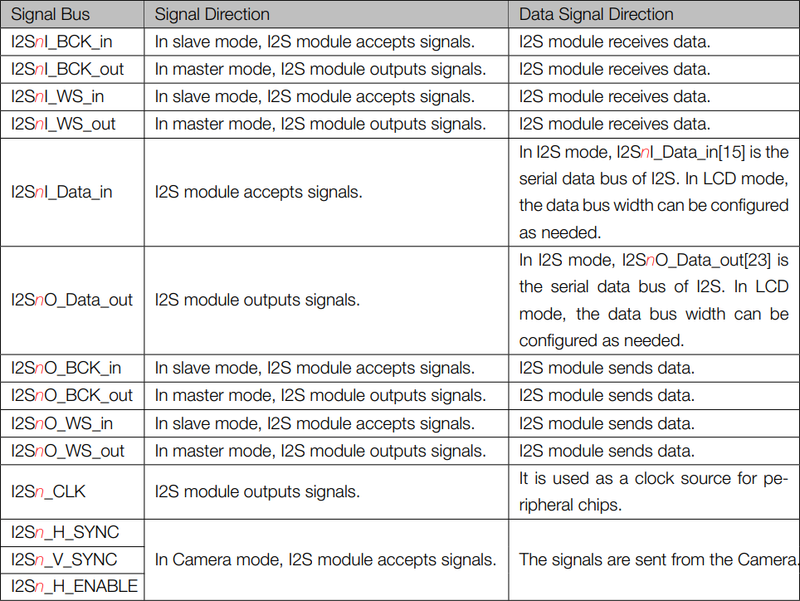 Either way it might be I2S ESP32-style, but in those two other interfaces it’s not I2S Philips serial PCM audio-style. Because most I2S interfaces can work with clock rates into the many megahertz, their bandwidth can be surprisingly high. It’s the same as the principle behind any software-defined radio transmitter: at a stroke and with very little extra hardware you have transferred the task of creating arbitrary spectra in the MHz range from hardware to software. Even the most pedestrian of modern microcontrollers have enough computational power for the task, rendering relatively straightforward some applications for I2S that would have been beyond the imaginations of those Philips engineers of the 1980s. Suddenly that one-trick pony to which you could only hook up an audio DAC becomes a lot more useful, and the possibilities are endless. Header image: Philips TDA1541A 4x oversampling I2S DACs in a CD player. Cjp24 [CC BY-SA 3.0]. Very early integrated circuits were packaged in metal cans like the transistors of the day. Welded gold bond wires connected the die to the external pins. Open one of these old IC packages like a can of tuna, and the wires are plain to see. When DIP packages came about, they continued to use bond wires to connect the die to the IC pins, even though they were encapsulated in the plastic package. This trend continued into surface-mount packages like SOIC, SSOP, and even BGAs, because it worked pretty well for parts from that period. But, as IC technology advanced, these packages became problematic. The first snag was the burgeoning size and complexity of the chips. As they grew, so did the number of connections required. Unfortunately, while the complexity grows with chip area, the number of possible wire-bond connections grows with the perimeter of both the die and the old-style packages. It’s X2 vs X, and at some point, there just isn’t enough space on the perimeter, so a more dense connection method had to be devised. A second problem was the performance of the wire bonds themselves. Like any conductor in free space, these little wires behave as inductors. This inductance can have serious consequences for high-speed circuits. As IC speeds increased, the inductance of the bond wires plus that of the package leads started to become a serious issue. A good solution to both problems is to turn the semiconductor die upside down. With the chip flipped this way, the connections can be made directly from the chip to the next layer below without any bond wires. This allows for more connections, since bond pads can be placed anywhere; there’s no need to restrict them to the periphery of the die. For pad-limited designs with many I/O connections, this can actually result in a smaller chip. Additionally, the connections can be made with a short, thick metallic bump, which has much less inductance (around an order of magnitude less) than traditional bond wires. In some cases, flip chips connect directly to printed circuit boards using solder balls. In others, the die may be connected first to traces on a substrate, similar to an intermediate PCB, that then connects to the board itself. 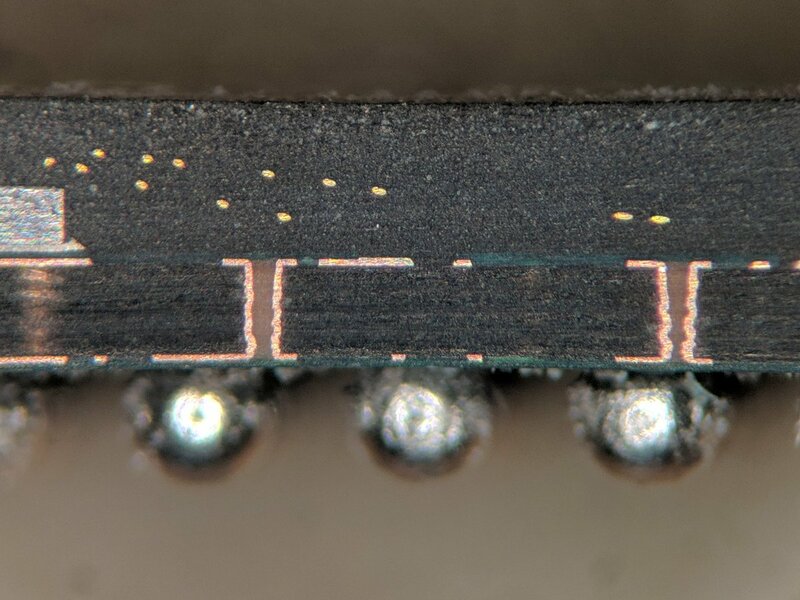 Traces on this intermediate layer connect the solder bumps from the die to the board connections. This allows for fanning-out connections on the die that would otherwise be too closely pitched for PCB connections. Vias in a wire-bond BGA substrate. Similar substrate layers connect flip-chip BGAs. Image credit: CC-BY-SA-4.0 @TubeTimeUS who have published amazing images inside components. While we may think of flip-chip technology as the new kid on the block, it’s actually been around for a long time. IBM pioneered the idea for discrete diodes and transistors in their mainframe computers of the 1960s, and it was later adapted for use in automobile electronics in the 1970s. Today, the technique is commonplace, and used in a wide variety of applications. 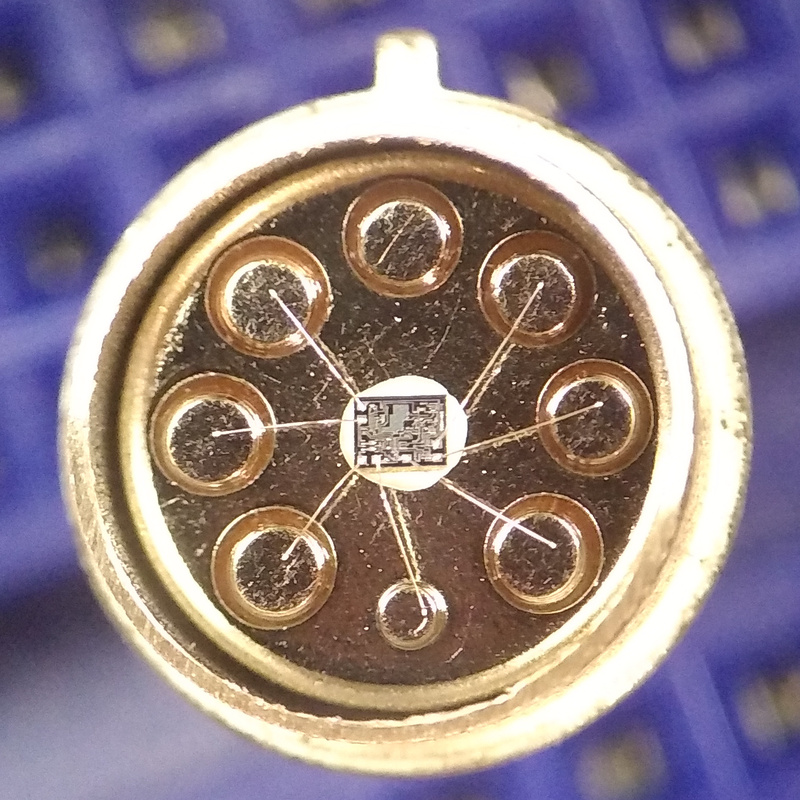 Not all leadless SMT packages have upside-down dice; there is a great diversity in IC packages. 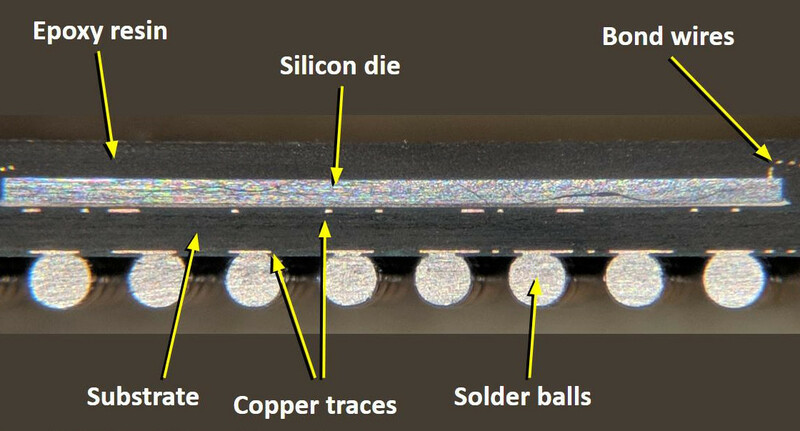 Some BGA packages use wire bonding, connecting the die pads to conductive traces on the package substrate before ultimately terminating in the solder balls on the bottom of the package. Likewise, the dice in QFN packages may be of either orientation. Sometimes the only way to know — just for curiosity’s sake — is to take a look inside the package. 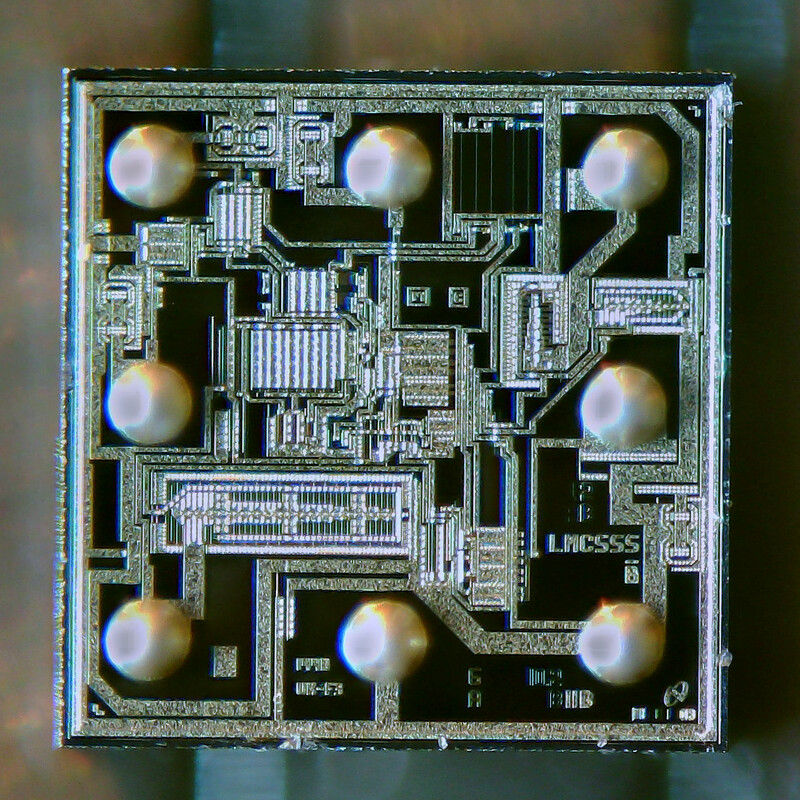 Wafer-Level Chip-Scale Packaging LMC555 timer in die-size ball-grid-array (DSBGA) package. This is a flip-chip. So, once you’ve decided to connect the die directly to the PCB, an interesting opportunity arises. You can turn the die into the packaging, and construct the whole assembly while the chips are still on the wafer. This is exactly what’s done in wafer-level chip-scale packaging (WLCSP). In this process, after the wafers have been manufactured, solder bumps are deposited on the bond pads, and an encapsulation coating is applied to both sides of the wafer. The now packaged chips, still on the wafer, are then tested and marked before being cut into individual units. This is a very efficient way to package the devices, and makes for a very efficient use of board space: since the package is the same size as the die, you just can’t get it any smaller. While these chips are wonders of packaging efficiency, they can suffer some strange maladies. If you own a Raspberry Pi 2, you may be familiar with one of them. Shortly after its release, an interesting issue came to light when it was found that a bright flash (or a properly directed laser pointer) would interfere with the operation of a power regulator on the PCB, causing the Pi to reset. The chip in question was in a chip-size package with the die exposed below, and it turned out to be light-sensitive. Oops. Maybe the most interesting problems with flip-chips, though, have to do with another sensitivity, specifically to alpha radiation. 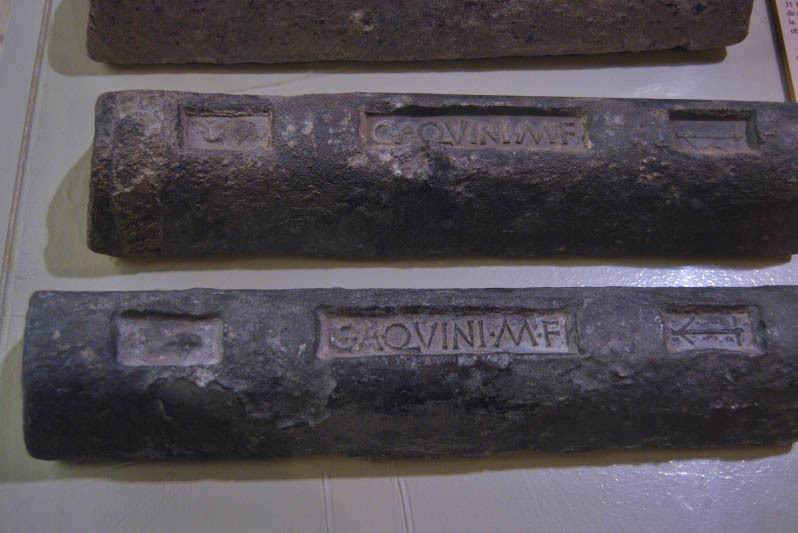 Shipwrecks and Soft Errors Ancient Roman lead ingots, which emit very little alpha radiation. IBM first noticed in 1979 that their ceramic-DIP packaged DRAMs were susceptible to bit errors due to alpha particle emissions from the package lids. These alpha particles caused soft errors: one or more flipped bits with no damage to the hardware. Later, when flip chip packages became commonplace for complex ICs, soft error rates started to climb. The culprit: alpha particles emitted from tin-lead solder balls. Alpha particles have very little penetrating power; a sheet of ordinary paper will stop them. Before flip chips, the packaging and even the silicon substrate itself provided adequate shielding, but when turned upside down, the sensitive side of the IC is now facing the solder. The resulting error rates could be alarmingly high. A Xilinx white paper from 2004, for instance, describes an issue arising from a packaging vendor incorrectly using high-alpha (i.e. “normal”) solder to assemble some of their flip-chip FPGAs, resulting in bit errors as often as every 230 hours of operation. While we typically think of lead as a radiation shielding material, newly smelted lead is, in fact, slightly radioactive. Lead ore typically contains traces of uranium-238, which naturally decays (via a complicated chain) into a radioactive isotope of lead, Pb-210. Pb-210, in turn, eventually decays, with a half-life of 22 years, into Po-210, taking a brief stop as bismuth along the way. The final decay of Po-210 into stable Pb-206 releases an alpha particle, and that’s what causes the problems. Separating isotopes isn’t easy. This fact keeps nuclear weapons out of the hands of all but the few most powerful nation-states, but also makes it difficult to separate radioactive lead from the innocuous Pb-206. However, like most issues involving radioactivity, if you can wait long enough, the problem will go away by itself. Once the lead has been refined, the source of Pb-210 – the radio daughters of U-238 – is removed, and any existing radioactive isotopes begin to slowly cool off. After a few hundred years, very little alpha activity remains. So, one source for so-called low-alpha lead is metal that was refined in antiquity. I remember around the turn of the century hearing about companies salvaging old lead from ancient shipwrecks to make low-alpha solder for vulnerable components, specifically the advanced microprocessors and FPGAs of the time. The lead was originally ballast or hull cladding, or carried as cargo, since it found use in an amazing variety of ways in ancient times – including plumbing for drinking water. Salvage companies would locate shipwrecks and other sources of ancient lead and scavenge it for use in sensitive electronic assemblies. This practice would later become quite controversial as archaeologists grew concerned that valuable artifacts were being melted down, erasing cultural heritage. Although the headlines in 2013 were about physicists using ancient lead for neutrino experiments, by that time it was pretty clear that this isn’t a sustainable solution for electronic assembly. While some ore deposits are naturally less radioactive than others, and laser-based methods for isotope separation hold some promise, there aren’t really great solutions for economical low-alpha lead. For specialty applications where leaded solder is still required, alpha decay continues to be an expensive problem. It would seem that with the RoHS directive, which mandates removal of the lead from solder, the alpha problem would be solved. Unfortunately, even at RoHS-allowed levels of contaminants, “lead-free” solders can still be hot enough to cause problems. In many cases, the activity of these so-called lead-free solders is due, surprisingly, to our old friend Pb-210. Lead is a natural contaminant in many metal ores, and tin sources may contain enough Pb-210 to cause problems for sensitive circuits, even when purified to “lead-free” solder standards. As a result, there’s an industry surrounding the production of low-alpha tin and RoHS-compliant solders, but of course, they aren’t cheap. So, the next time you slap an IC onto a board, give a little thought to the package itself. And, if you’re seeing some strange behavior with your exposed-die part, consider your solder. You might just need some ancient lead. Translating rotary motion to linear motion is a basic part of mechatronic design. Take a look at the nearest 3D-printer or CNC router — at least the Cartesian variety — and you’ll see some mechanism that converts the rotation of the the motor shafts into the smooth linear motion needed for each axis. Do Space Probes Fail Because Of Space Weather? There is one thing that unites almost every computer and logic circuit commonly used in the hardware hacking and experimentation arena. No matter what its age, speed, or internal configuration, electronics speak to the world through logic level I/O. A single conductor which is switched between voltage levels to denote a logic 1 or logic zero. This is an interface standard that has survived the decades from the earliest integrated circuit logic output of the 1960s to the latest microcontroller GPIO in 2018. Temperature is one of the most frequently measured physical quantities, and features prominently in many of our projects, from weather stations to 3D printers. Most commonly we’ll see thermistors, thermocouples, infrared sensors, or a dedicated IC used to measure temperature. It’s even possible to use only an ordinary diode, leading to some interesting techniques. When you first learn about digital logic, it probably seems like it is easy. You learn about AND and OR gates and figure that’s not very hard. However, going from a few basic gates to something like a CPU or another complex system is a whole different story. It is like going from “Hello World!” to writing an operating system. 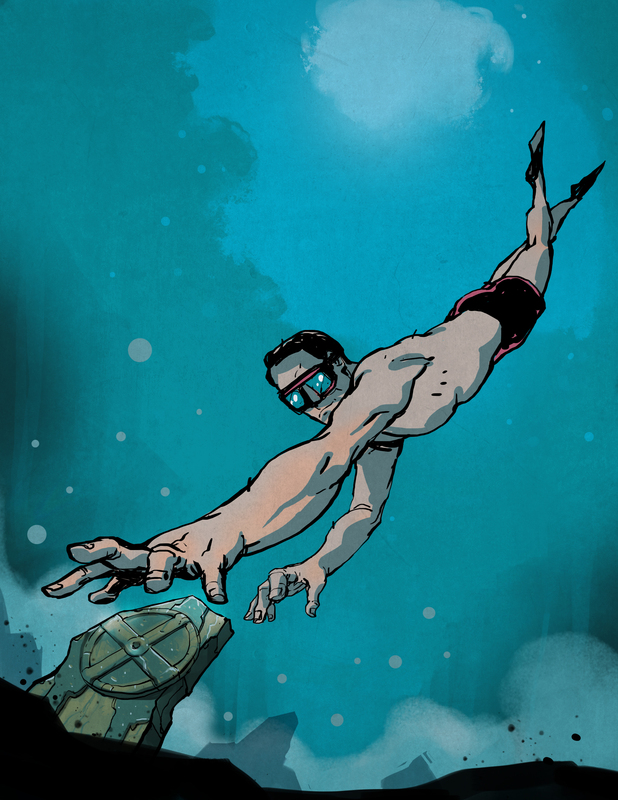 There’s a lot to understand before you can make that leap. In this set of articles, I want to talk about a way to organize more complex FPGA designs like CPUs using a technique called pipelining. Have you ever torn open an Ethernet jack? We’d bet the vast majority of readers — even the ones elbow-deep into the hardware world — will answer no. So we applaud the effort in this one, but the conclusion landed way off the mark. Since humans first starting playing with electricity, we’ve proven ourselves pretty clever at finding ways to harness that power and turn it into motion. Electric motors of every type move the world, but they are far from the only way to put electricity into motion. When you want continuous rotation, a motor is the way to go. But for simpler on and off applications, where fine control of position is not critical, a solenoid is more like what you need. These electromagnetic devices are found everywhere and they’re next in our series on useful mechanisms. Last time we looked at Spice models of a current sink. We didn’t look at some of the problems involved with a simple sink, and for many practical applications, they are perfectly adequate. However, you’ll often see more devices used to improve the characteristics of the current sink or source. In particular, a common design is a current mirror which copies a current from one device to another. Usually, the device that sets the current is in a configuration that makes it very stable while the other device handles the load current. Right now, if you happen to be in Noth America, chances are pretty good that there’s at least one little face staring at you. Look around and you’ll spy it, probably about 15 inches up from the floor on a nearby wall. It’s the ubiquitous wall outlet, with three holes arranged in a way that can’t help but stimulate the facial recognition firmware of our mammalian brain. For as busy as things can get at the grocery store on a typical afternoon just before the dinner hour, at least the modern experience has one thing going for it: it’s relatively quiet. Aside from the mumbled greetings and “Paper or plastic?” questions from the cashier, and the occasional screaming baby in the next aisle, the only sound you tend to hear is the beeping of the barcode scanner as your purchase is tallied up. Levers are literally all around us. You body uses them to move, pick up a pen to sign your name and you’ll use mechanical advantage to make that ballpoint roll, and that can of soda doesn’t open without a cleverly designed lever. Lathes are complicated machines, and buying one requires weighing a lot of options. We’ve already talked about buying new Asian, or old American machines (with apologies to the Germans, British, Swiss, and all the other fine 20th century machine tool making-countries). We also talked about bed length and swing, and you ain’t got nothin’ if you ain’t got that swing. Let’s talk about the feature set now. If you’re buying new, you’ll shop on these details. If you’re buying used, knowing the differences will help you pick a good project machine. In July 1940 the German airforce began bombing Britain. This was met with polite disagreement on the British side — and with high technology, ingenuity, and improvisation. The defeat of the Germans is associated with anti-aircraft guns and fighter planes, but a significant amount of potential damage had been averted by the use of radio. Building a robot that can do anything well is a tough challenge. Building one that can stand up to another robot trying to violently put it out of commission is an even harder task. But it makes for some entertaining television! It is this combination that thrust a few creative robot building teams into the world of Robot Wars. Even before the Industrial Revolution, gears of one kind or another have been put to work both for and against us. From ancient water wheels and windmills that ground grain and pounded flax, to the drive trains that power machines of war from siege engines to main battle tanks, gears have been essential parts of almost every mechanical device ever built. The next installment of our series on Mechanisms will take a brief look at gears and their applications. Abstract: The workshop gives a introduction into social engineering including hands-on examples and practical training. Abstract: Electronics are embedded into nearly everything we use. Hardware products are being relied on for security-related applications and are inherently trusted, though many are completely susceptible to compromise. In this workshop, Joe will discuss the hardware hacking and reverse engineering processes, and then provide an open lab environment for you to probe, analyze, and hack. Joe will bring a variety of products to tinker with, though attendees are heavily encouraged to bring their own pieces of hardware to explore. Basic tools and electronics test/measurement equipment will be provided. You'll leave the workshop with new skills, ideas for further attacks, and maybe even some defeated hardware. Abstract: How to build your own lab in your basement for engineering and reverse-engineering on a budget. Demystifying modern System On a Chip (SOC) Micro-Controllers for early hardware prototyping and software development. Practical reverse engineering; using your verification tools to reverse engineer and modify systems without source code. A presentation on getting started with embedded engineering. There is a lot to be said about the work area required for embedded engineering, what tools you will need and how to use them to accomplish useful tasks. An overview of hardware and software necessary to develop or reverse engineer embedded devices. As you will learn in this talk the tools are the same for both tasks. When you begin an embedded project of your own, what chips do you want to use? How do you go about prototyping your hardware? What methods should be considered before designing the system. Is your task better suited to multiple microcontrollers? Once you start writing code, how do you test it? Will your method of loading a binary into your final hardware differ? Do you need to write a bootloader? All these questions need to have answers to tackle an embedded project, we will be showing a variety of methods to solve these common questions. When reverse engineering a device, you need to figure out how it was put together. You need to get into the designer's head and figure out what methods were used to create the device. As you begin to answer these questions you can slowly unravel the device's secrets. We will show some techniques for reverse engineering embedded electronics and firmware and present a plethora of resources to start you off on your own journeys into this field. Abstract: This talk will cover two rootkits used as reverse engineering tools, one rootkit support library, one IDA plugin, and talk setup material. The talk itself will be given over VOIP and VNC running over the Tor network to demonstrate a proof of concept on anonymous public speech. This talk will present Tron, an extension of the Shadow Walker memory cloaker technique. Tron is a kernel driver who can cloak userland memory, and provides an API that allows the user to cloak arbitrary process memory, set permissions, signal changes of trust, conceal DLLs, and read/write hidden memory. An accompanying IDA plugin that uses this API to conceal software breakpoints will be discussed, and Another Debugger Hiding Driver, or ADHD will be presented as well. While these tools have many legitimate uses from malware analysis to legal reverse engineering and program modding, it is possible that Tron in particular can be used as a component of a "copyright circumvention device", which renders it prohibited by the USA DMCA. For this reason, but more so out of a desire to demonstrate a "proof of concept" for how to anonymously speak publicly, the speaker will be giving the talk over VOIP and VNC relayed through the Tor network. In addition to taking questions over VOIP, the speaker will also be briefly available on IRC afterwords for questions + discussion about Tron, reverse engineering, and the speech setup. Abstract: The event aims on reverse engineering small boxes you can buy at your local Saturn or Media Market like SOHO Routers. It will be presented what you can do to get access on a box. This lecture includes firmware reversing as well as opening the box, voiding the warranty and see what you can do. Abstract: Biological engineering does not have to be confined to the laboratories of high-end industry laboratories. Rather, it is desirable to foster a more open culture of biological technology. This talk is an effort to do so; it aims to equip you with basic practical knowledge of biological engineering. Genetic engineering is now a thirty year old technology. For reference, over a similar period of time, modern computing machines went from exclusive objects used to design weapons of mass destruction, to the now ubiquitous panoply of personal computing devices that support mass communication and construction. Inspired by this and many other past examples of the overwhelmingly constructive uses of technology by individuals, we have been working over the past five years to develop new tools that will help to make biology easy to engineer. We have also been working to foster a constructive culture of future biological technologists, who can reliably and responsibly conceive, develop, and deliver biological technologies that solve local problems. This talk will introduce current best practice in biological engineering, including an overview of how to order synthetic DNA and how to use and contribute standard biological parts to an open source collection of genetic functions. The talk will also discuss issues of human practice, including biological safety, biological security, ownership, sharing, and innovation in biotechnology, community organization, and perception across many different publics. My hope is that the conferees of 24C3 will help me to understand how to best enable an overwhelmingly constructive hacker culture for programming DNA. Abstract: The MOS 6502 CPU, which was designed in 1975 and powered systems like the Apple II, the Atari 2600, the Nintendo NES and the Commodore 64 for two decades, has always been subject to intense reverse engineering of its inner workings. Only recently, the Visual6502.org project has converted a hi-res die-shot of the 6502 into a polygon model suitable for visually simulating the original mask at the transistor level. This talk will present the way from a chip package to a digital representation, how to simulate transistors in software, and new insights gained form this research about 6502 internals, like "illegal" opcodes. The presentation only requires a basic understanding of assembly programming and electronics, and is meant to teach, among other things, the methods of efficient and elegant chip design used in the early years of integrated CPUs. The talk consists of three parts. The first part, "6502 from top down", describes the programmer's model, as well as the basic layout of the components of the CPU. In the second part, "6502 from bottom up", we describe how to decap and photograph chips, convert each physical layer of the chip into a polygon model, and how to finally convert this into a network of wires and transistors suitable for logic simulation. The third part, "6502 from the inside out", explains the inner workings of the CPU: how the logic blocks work together, how an instruction is decoded by the PLA ROM into controlling these blocks and busses, and how details like interrupt delivery work. Finally, this information can be used to describe and explain undocumented behaviour, like illegal opcodes and crash instructions, and explain bugs like the BRK/IRQ race, the ROR bug and spurious reads and writes in certain situations. Abstract: All the talks i saw about SE so far just showed which good SE's the speakers are. I try to do another approach, what if i get in and don't know what to do then. The talk is about the reconn. before the assessment, the different approaches of SE. Which techniques can one use, how to do a proper intel. and what is useful. How things work and more important why. Which skill set should one have before entering a engagement. And last but not least how do one counter a SE attack. This proof of concept reverse engineering code demonstrates SEHOP chain validation. Whitepaper called Social Engineering - The Human Factor. It documents suggested phases of the social engineering lifecycle and associated techniques for implementation. Abstract: This is a brief tutorial of one of the reverse engineering tools (Hardware Emulator) used by the Air Force Research Laboratory to analyze application and driver code on x86 systems. It’s also a neat way to debug hypervisors! Whitepaper called Social Engineering Toolkit. This article covers backdooring executables and evading antivirus using scripts included with BackTrack. Abstract: Social Engineering is considered by many as a sort of magical art form in the Infosec world, some of the best at it must have Jedi like powers to get into some of the places they do. The magic or art of SE is all about creating a situation that suggests you belong, and are perceived to be just like everyone else just going about your business. Some people have a natural flare for SE, they are good at building rapport and are generally likeable. People say that SE exists because of human stupidity and there is no patch for it, but what if you can understand why the human brain is susceptible, if you understand this better can you be more successful in your SE exploits, and can you use this to educate and perhaps help apply that patch. During my talk I will discuss how I looked at methods and skills that can be learnt to better understand how the human brain works, and how it can be manipulated. This will take us on the journey and fun of looking at NLP patterns, mentalism and becoming a hypnotist myself. We will talk about why these skills can improve your success as a social engineer, as well as being more aware of being manipulated yourself. Whitepaper called Reverse Engineering and Memory Patching. Abstract: This session will introduce the concepts of exploit reverse engineering in support of incident response and/or post mortem analysis. Attendees will learn the tools and techniques required to take malicious exploit code and understand what it is targeting and how to identify and prevent future success against the enterprise. This will include a live demonstration of the techniques to re-enforce how to reverse exploit code. Abstract: JTAG is an industry standard for accessing testmode functionality in almost any complex microchip. While the basics of JTAG are standardized, the exact implementation details are usually undocumented. Nevertheless, JTAG often allows you to interact with the chip very deeply, which makes it very interesting since it is often easily accessible thanks to the small pincount. This talk covers reverse engineering of JTAG interfaces when no or only limited documentation is available. JTAG is an industry standard for accessing testmode functionality, and is available on almost any complex microchip. It is often for functional testing while doing wafer sort, during board production, product development and service. While the basics of JTAG are standardized, the exact implementation details are usually not available in public datasheets. Very often, even when signing a vendor NDA, only limited parts of JTAG will be documented (like boundary scan and the CPU debug interface). JTAG, however, often allows a much deeper interaction with the chip, and often, security is falsely established though obscurity by providing undocumented testmodes. JTAG isn't only available on CPUs, but also on a lot of other peripherals, which turns them into an interesting target if they provide busmaster access to a system bus. Abstract: DisplayLink produces nice, useful USB graphics adapters. Unfortunately, they had no real Linux support. In this talk, we'll describe how we first reverse-engineered the encryption and basic protocol, prompting DisplayLink to actually release a Linux driver on their own. However, their driver still doesn't support compression. In the second part, we'll therefore describe how we reverse-engineered the compression algorithm.